South Sydney coach Wayne Bennett has written himself into the Book of Feuds after calling the Sydney Roosters immature for their shot at Cody Walker. Walker was labelled "disrespectful" by Roosters star Luke Keary for sledging during the Rabbitohs' 26-16 round-one NRL victory over the defending premiers. 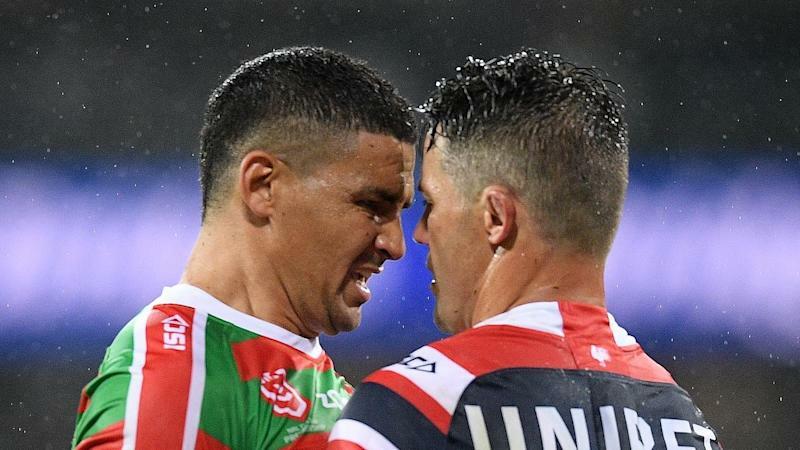 Walker and Roosters star Cooper Cronk exchanged barbs late in the second half, prompting a minor melee between the rival clubs in what was a heated battle. "I don't know what all the noise was about. What I know sledging to be, that wasn't sledging," Bennett said on Wednesday. "There's three key words we use today, mate: Leadership, disrespectful and consistency. And most of the time it wasn't disrespectful. "It's two guys having a go at each other, simple as that." It is the latest chapter in the simmering rivalry between the two foundation clubs, setting up a mouth-watering rematch in round 25. Roosters second-rower Angus Crichton was also subjected to taunts of "traitor" following his off-season move from Redfern. Earlier this week, Keary, a member of the Rabbitohs' premiership side in 2014, said it was merely how Walker "plays the game". The Roosters five-eighth also warned Walker that his comments could come back to haunt him, but Bennett believed the reaction was excessive. "It's the immaturity we have in the game today," Bennett said. "The man psyche is, 'Get off the field, forget about it and move on with life.' Some of the boys just don't grow up early enough any more." Pressed on whether he addressed the issue with Walker, Bennett said: "Haven't said a word to him. I'm not going to waste my time talking about rubbish." After taking down the reigning premiers, Bennett is now wary of his team meeting a weakened St George Illawarra team on Thursday night. Not only will the Dragons be without Jack de Belin due to the no-fault standown policy by the NRL, but Tyson Frizell is also sidelined with a ruptured testicle. The inexperienced Blake Lawrie starts at lock, while Josh Kerr will make his NRL debut off the bench. "They're still the Dragons. They've still got quality players there," Bennett said. "We need to not worry about them. We need to make sure our game's right, we turn up there and play to our ability and then we'll test them. "If we don't do that, they'll be all over us."